I read Going Around the Sun: Some Planetary Fun, or rather sang it to the children, today. It's another one of Marianne Berkes' books, with text set to go along with the tune of "Over In The Meadow". Her Somewhere in the Ocean, has been a long time favorite of ours, so we were happy to find this one. 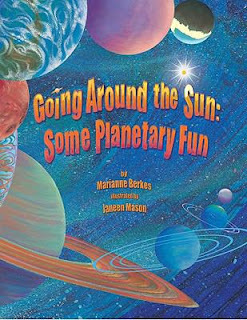 The words of Going Around the Sun, don't seem to fit quite as well with the song, as the text of some of her other books, but it is still very informative about the solar system, and a lot of fun to read. After I finished reading...er, singing...we made a set of melted crayon planets, following instructions from the illustrator's notes at the back of the book (it is just one of the extension activities suggested by both the illustrator, Janeen Mason, and the author, in their final notes). Janeen Mason, actually used a melted crayon technique, the kind where you place your paper on a tinfoil covered griddle, and then draw on it with crayons as they melt, to create the backgrounds for this book's illustrations. We used the more traditional, crayon shavings between wax paper, for our planets. It's a project similar to others we've done in the past, but I'll detail it here, just in case it's new to you. I plugged in an iron, and allowed it to heat up, while the children sharpened, peeled crayons onto wax paper, set on top of a towel. You want a towel thick enough to protect your work surface from the heat of the iron, and you want an old towel, that you won't mind possibly ruining. The crayon sharpening process can be a little tedious, so I put on an episode of "The Magic School Bus, Lost In Space" for the children to watch, as they took turns with the sharpener. ...to melt the shavings (do this with a dry iron - no steam). Finally, the children traced circles on the wax paper, and cut out their planets, pretty well one planet per melting. We tried to vary the colors of our planets, but didn't work overly hard at getting the correct size scale - our Jupiter, for instance, is the same size as our Earth. Pre-cutting paper templates, might help, to use as a guide, if you want planets more to scale. Once they were cut, I sandwiched each planet in the towel again, and gave them another pass with the iron, just to seal the edges. Then, the children taped them up to our sliding glass door to catch the morning sun. Very pretty! My kids love to make suncatchers this way. Very cool! I love how they look in the window! Seeing this project provoked me to put that book on hold at the library. Great job! Oh my goodness, I love this so much. I just walked through a 'space museum' in my children's bedroom tonight. They are going to flip over this. Thank you! This is so neat! Your planet turned out so pretty. Lovely. Earth looks very real! Ok. That is insanely creative. Bravo. Bravo. Ohhhh I've made the earth ones before, but never all the planets, how fun!